A solid wall of corded muscle and fierce strength, Agatha dominates rooms merely by entering them. 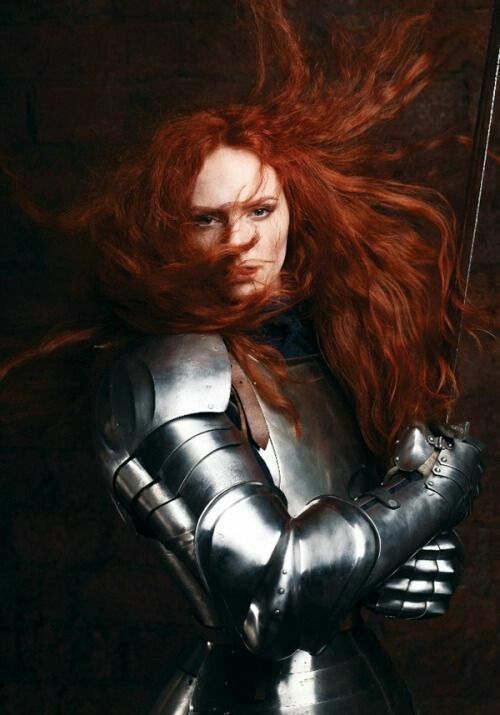 Her martial stride, broad shoulders and lofty height make her impossible to miss, and the waves of her richly auburn hair make of her not just a giant but a fire giant, sparking with energy and life. The visible strength of her muscular arms suggest that she'd as soon dead hang as stand straight. Her eyes shine brilliant blue as a summer sky, framed by pale reddish lashes, and snap with intensity or sparkle with humor. It's easy to read her face: strong jaw, bold cheekbones, a profusion of freckles dusting skin too weathered a fair to be creamy or pale. Some call Redrains Bears, and if they are bears, Agatha is the roar of their voice. Blunt, brash and powerfully alive, it's almost impossible to miss when Agatha enters any given room because she's just such a loud and vehement woman. It's not that she rejects the panoply of civilization -- indeed, she can enjoy a good show as much as the next fellow -- but she tends to become part of performances; an entire audience's worth of applause in one hearty woman, whole dialogues with exclamation points for every sentence, a laugh that could shake a mountain to its root. To get in Agatha's way is to simply be trampled, and the fact of the matter is, it's not entirely sure that she'd notice she'd done it. Sometimes the shortest distance between two points is a war, but honestly Agatha might even prefer it that way. The wealth and privilege of the North do not always manifest in the same ways as the wealth and privilege of the South. Farhaven is not remote to the point of being entirely uncivilized, and yet there is still a brusque forthrightness that its children grow famous for, a wildness of the blood, sometimes coupled with a clarity of vision, that those who are more accustomed to the obfuscations of politics might not be able to channel. In youth, Agatha developed a headstrong nature early, and never abandoned it. For many children, a fall from a horse is reason to avoid horses; for Agatha, a fall from a horse was a reason to bloody well conquer the entire stable. Failures -- in the practice yard, in the schoolroom, in the woods and on the mountainside -- did nothing to deter her from her goals, whatever they were. They were merely added incentive to succeed on the next try. Agatha did not actually set a record for broken bones in the course of her training, but her knight trainers consistently told her that she was at risk of doing so. Yet she healed well and quickly, apparently by applying her force of will to her body, or maybe just by nagging so hard and so aggressively that finally she was permitted to leave the infirmary and get out into the world again regardless of how ready she ought to be for it. Warcraft lured her with her own aptitude -- her strength and acumen with weapons made her want to get out into the world and demonstrate her prowess and earn glory for her house, but meanwhile she struggled with history and mathematics and the things that make a war leader instead of a knight. Yet she applied her focus and her determination to these things as much as to her training, because she simply refused to fail, and she breached the walls of adulthood as a young knight with a fierce desire to prove herself and defend her family from all comers. Originally she was going to spend more time working with the troops in Farhaven and defending the home guard, but as several of her relations of the blood fell in battle or out of it, she determined it was time to join her family in Arx and lend her spear to the defense of the Compact.